After Korean-born artist Do Ho Suh moved to London a few years ago to be with his wife, he missed his adopted home of New York. He kept a 500-square-foot live-in studio there, in a former sailors' dorm in Chelsea, and began to contemplate ways of memorializing it. 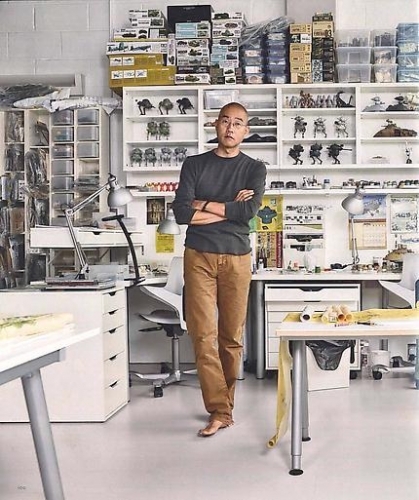 Many of Suh's most famed sculptures had reimagined his homes—in translucent fabric or resin, or as a painstakingly detailed, oversize dollhouse—from his childhood in Seoul and his young adulthood in the United States. This time, though, he wanted to make a drawing. Except Suh was not content to sit in a chair with a pad and pencil and render what he saw. Instead, he covered every inch of the interior—walls, floors, ceiling, refrigerator, window air conditioner—with paper, then rubbed with a blue-colored pencil, the way a child might preserve the memory of a leaf in the fall. "Rubbing is a different interpretation of space. It's quite sensuous—very physical and quite sexual," says Suh, wearing a T-shirt and shorts on a late summer day in his London studio. "You have to very carefully caress the surface and try to understand what's there." That dictum could easily apply to the entirety of Suh's oeuvre, which has explored the varying meanings of space, from the smallest territory we occupy—our clothing—to our homes and homelands. Issues of memory, history, displacement, identity and the body all come into play. In an age of exponentially increasing globalization, Suh's consideration of what it means to belong strikes a nerve. His almost uncanny ability to hit these major touchstones of our time—and do it with the lyricism of a poet—has made him one of the most internationally in-demand artists of his generation. Suh has fashioned a monumental emperor's robe from thousands of soldiers' dog tags and precariously perched a fully furnished house on the edge of a roof seven stories up. He has used his personal history of wearing uniforms—from schoolboy to soldier—as the basis for a self-portrait, and set an army of tiny figurines under a glass floor, inviting viewers to walk on the artwork without necessarily even realizing it. In Suh's mind, it all has the same origin: "Everything starts from an idea of personal space—what is the dimension of personal space," says Suh. "What makes a person a person, and when does a person become a group? What is interpersonal space—space between people?" "The whole approach is quite rich," says Rochelle Steiner, professor at the USC Roski School of Fine Arts, who is working on a book about Suh's drawings. "He's been very, very inventive." With a boyishly round face and a playful grin, Suh looks younger than his 51 years by a decade, but he exudes the seriousness of a veteran artist. It's a disposition he knows well: His father, Suh Se-ok, is a well-regarded abstract painter in Seoul. After secondary school, the younger Suh had hoped to become a marine biologist, but with a poor math score standing in his way, he applied to art school at the last minute and was accepted. He studied traditional Korean painting before following his first wife, a Korean-American grad student, to the states in 1991. The Rhode Island School of Design (RISD) was the only American art school to accept him, and though he'd already earned a master's degree in Seoul, RISD insisted he enter as a sophomore. Still, immigrating alleviated some of the pressure of being his father's son. "I felt relieved when I went to the states," he says. "I felt much more freedom. I realized the danger of having a father like mine—he's going to always come up—but in the U.S. my father is nobody." Asked how his father regards his success, Suh says, "I'm not sure if he feels proud of me. I don't know if he feels competition. He doesn't show those things." At RISD, Suh couldn't get into the classes he most wanted to take and ended up enrolling in The Figure in Contemporary Sculpture. "It changed the course of my life," Suh says, adding that the professor, Jay Coogan, "is responsible for my becoming a sculptor." Presented with the first assignment—use clothing to consider the human condition—Suh delved into ideas about the body, a topic that was taboo in Korea. Around the same time, the Rodney King riots erupted in Los Angeles, and news images of armed Korean immigrants protecting their stores made Suh think for the first time about how non-Koreans perceived his ethnic group. His classmates, he recalls, all younger than he, related neither to the immigrant experience nor to the mandatory military training that every Korean man, himself included, must endure. Fastening thousands of army dog tags to a military jacket, Suh created his first major sculpture: Metal Jacket. The modern-day coat of armor touched on many of the themes—personal space; the tension between the individual and the group; the inevitable culture clashes that arise with human migration—that continue to preoccupy his work, and it also became the prototype for Some/One, the imposing robe made of dog tags. From a distance, the viewer sees each sculpture as a single silvery surface. Only upon closer inspection does it register as a mosaic of dog tags, each representing an individual soldier. Coogan, now the president of the Minneapolis College of Art and Design, recalls his reaction to Metal Jacket: "Oh my gosh! His work was so fantastic. It was ambitious in scale and in the kind of global ideas he was working with." Coogan, who has remained close to Suh, adds, "Do Ho is exploring issues of what divides us and what unites us as human beings." In 1997, Suh scored a prestigious two-person show at New York gallery Gavin Brown's Enterprise before earning an MFA from Yale and moving to Manhattan. As he continued to exhibit new work, his hauntingly powerful pieces about the nature of home quickly gained notice. He made versions of his parents' house in Seoul—a traditional slope-roofed hanok, quite out of style when his father commissioned a former carpenter at the royal palace to build it from reclaimed wood in the 1970s—in dreamy fabric, suspended from a gallery ceiling. "It has an interesting narrative," he says of his childhood house. "But then, every building, every space, has that. It's just not told." Using fabric gave the pieces a ghostlike quality. Viewers were invited to enter some of the installations, heightening the sensation of being in a home, or the memory of one. Suh recalls how his brother, an architect, was disconcerted to see strangers wandering under a version of their family home at a 2000 exhibition at New York's P.S. 1 museum. Fallen Star 1/5 (2008–11), one of his best-known works, takes a more solid model of that hanok and crashes it through the wall of a carefully furnished, dollhouse-like re-creation of the apartment building where he lived in Providence. Contrary to most viewers' assumptions, his various home pieces are not exact replicas. "It's intrinsically impossible to make them exact," he says. "I wanted to achieve something intangible. It's about memory, time spent in the space." In addition to exploring ideas about culture shock, Suh's works can have a sense of humor—a house teetering on a roof seems to be winking at The Wizard of Oz—and also a sense of loss. There is, of course, the rubble of the walls in Fallen Star 1/5, but even in a dog tag piece, viewers are left wondering what happened to the tags' owners, since only in death does a soldier part with the metal identification. Net-Work (2010), which was installed on a Japanese beach for the Setouchi International Art Festival, looks like a fishing net from a distance; only up close is it clear that Suh constructed it from scores of shiny figurines, each one's arms and legs outstretched to another's in the shape of an X. The piece was shown during typhoon season, and though the organizers insisted on securing it, Suh would have been content to see it wash away with the tide. "I thought it would be a beautiful thing to happen to the piece—nature comes and takes my piece away, takes it to the ocean, and the work disappears." Says his longtime friend and fellow artist Janice Kerbel : "The works in a way are like him—they're these very gentle things, almost like specters. There's something ethereal about Do Ho—he doesn't seem to belong to the place he's in." In 2010, Suh moved to London to join his second wife, Rebecca Boyle Suh, a British arts educator. Their first daughter was born soon after; their second followed this past summer. "I've been following my loves," Suh says of his continent hopping, adding with a laugh, "it was never a career move." If anything, London has been tougher to adjust to than the United States. "Things are so different here. I feel like it's a completely different language, mentality and humor. I miss a lot of American values—like being straightforward and more relaxed." His life in London revolves around family. He is not one to join the art world social scene. "His commitment to his practice is so intense," says Kerbel, who is also based in London. "He's a quiet person and keeps very much to himself. He needs that time to be alone and in his head." Suh maintains an international practice, taking intercontinental trips two to three times per month, including frequent stints in Korea, where the fabric pieces are sewn. Much of Suh's sculpture is site-specific, and even when it isn't, it's still context-specific. "I have to anchor myself to the context—the physical site or history," he says. When he was asked to make a piece for South Korea's National Museum of Modern and Contemporary Art, which is opening a new branch in Seoul this month, Suh considered the location of the museum itself—the site of the former palace—and the gallery the piece will be installed in, an expansive room called the Info-Box that has a view of the palace's last remains. In response, he created Home Within Home Within Home Within Home Within Home, a small hanok completely encapsulated by Suh's first American home in Providence. The extra three "homes" in the title refer to the museum, the palace complex and Seoul. At a scale of 1:1, it is the largest fabric sculpture by volume he has ever made. Also on his immediate agenda: his first drawings show, at Lehmann Maupin's two New York galleries. Slated for September 2014, the dual exhibition will feature excerpts from his Rubbing Projects. (One of the pieces is so big the gallery cannot accommodate the full structure.) Says Steiner, "I've never seen anybody use paper and line in such a multifaceted way." Suh is also making a video-performance piece that considers cooking as a type of personal space: He plays the host of a TV show, with his mother, as the chef, teaching him a recipe. He has recently taken on more architectural assignments as well, conceiving the Korean gallery for the Los Angeles County Museum of Art and is in discussions to design an actual house in the UK, the details of which are still under wraps. "As my career has developed, you have more opportunities," Suh says. "That's the great thing about getting old." There is an often-overlooked political undercurrent to Suh's work. For the 2012 Gwangju Biennale in South Korea, for example, Suh recalled the massacre of civilians that followed a protest there in 1980. "News was censored, so we didn't know what was going on," Suh says. "When I read the newspaper it was a patch of blanks—that never left me. When school started we students heard what happened in Gwangju from students who were there. Everything was fragmented. I was living only four hours away and didn't understand what was happening—it made me think about the problems of writing history." In response, Suh made rubbings of three spaces around the city. "That's a lot of rubbing," he laughs. He and his crew wore blindfolds for one of the rubbings, both as a means of intensifying the already tactile experience of an unfamiliar place and as a metaphor. "I didn't want to pretend to know about Gwangju," he says, offering the analogy of tourists visiting a city's standard landmarks. "You don't pay attention to the space between the landmarks, and the way we look at history is the same—we only remember the so-called important historical events." Therein, Suh says, lies his challenge as an artist. "It's an existential question of what we believe in this world—there are a lot of holes, but we try to believe it's whole, the way a lot of people see the house [sculpture] as an exact replica. There's a lot of rupture and gap. The role of the artist is to see those ruptures."